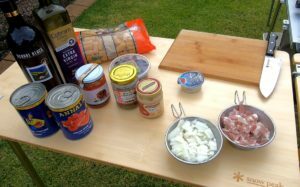 We used Uniflame cooking gear for this recipe which is available in Australia from Drifta Camping & 4WD. Heat olive oil and add chopped onion in a pan. Cook for 2-3 minutes before adding garlic. Continue stirring while cooking until onions are soft. Then add bacon and cook for a further 3 minutes. Add diced tomatoes followed by tomato paste and stir through. Add red wine, chilli, olives and capers, stirring well to combine. Cover pan with a lid and cook on a simmering heat for around 15-20 minutes, stirring occasionally. For cooking the pasta, bring some water to the boil and season well with salt before adding the pasta in. Cook for around 10-12 minutes, then drain water. To serve, we like to add a couple of spoonfuls of the sauce to the drained pasta to coat all the pasta first. Serve in bowls with extra sauce on top and lashings of your favourite parmesan or pecorino cheese. Note:- Recipe is suitable for 3-4 people, although this will normally do us (two adults) for two meals. The sauce is suitable for freezing so it’s simply a matter of “heat and “eat” next time. And that makes it perfect for camping!